On April 26, 1885 a group of armed militants arrived to claim the contents of the Green Lake Post. The river on this map of Green Lake flows into the Beaver River. 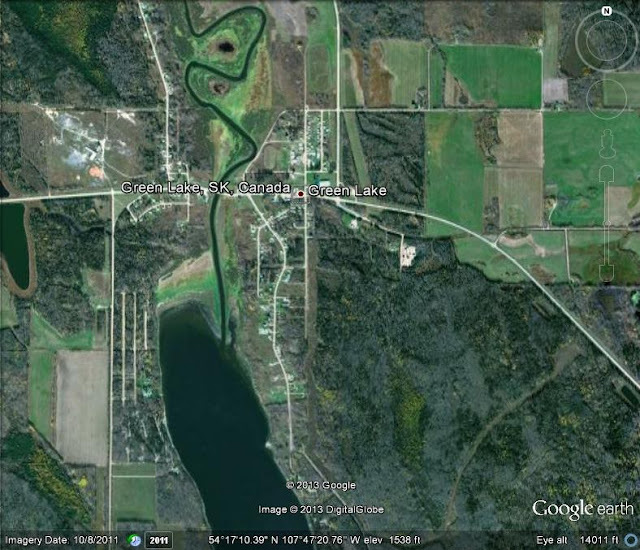 Green Lake is a village of 418 people in Saskatchewan a half hour drive north of the city of Meadow Lake. A Hudson's Bay Post called Green Lake House was located there. It was an important depot for the movement of supplies to the far north and was connected to Fort Carlton by an a ox-cart trail built in 1875-76. At the time of the North-West Rebellion the Green Lake post was waiting for the ice to break on the northern lakes so that the stockpile of goods in their warehouses could be safely sent up the Beaver River to Ile a la Crosse across the Methye Portage to the Clearwater River and to the Athabasca and Mackenzie River Districts. Within these warehouses were a years supply of goods destined for these northern posts. They included arms and ammunition in the form of lead shot and balls, 286 barrels of powder and 200 rifles. On April 26, 1885 a group of armed militants arrived to claim the contents of the buildings. However the factor of Green Lake House James Sinclair had been warned by the Oblate priest Father Mélasyppe Paquette and taken steps to protect the property of the Hudson's Bay Company. This is an account of the events at Green Lake in 1885..
Father Mélasyppe Paquette O.M.I. arrived in Green Lake and found the locals ready to fight and die for Riel. He talked to them and even threatened excommunication to all those who would fight for Riel. Having been persuaded they all left the post so as not to meet the rebels that could come at any time. Paquette also met with James Sinclair at the Hudson's Bay Post and told him all that happened since he left Saint Laurent on the 18 of March. James Sinclair who was in charge of all the merchandise held there for the Mackenzie District had no doubt his post would soon be pillaged by the rebels. He immediately gave the order to submerge into the lake all the lead balls and shot and loaded four York boats with 286 barrels of powder and 200 rifles along with a large quantity of stock and sent the brigade that night towards Ile a la Crosse. The next morning on April 26 he loaded the rest of his men and their families along with the missionary and his companions on another boat. As they were ready to leave the shore 25 Cree from Loon Lake stopped them. Sinclair was taken prisoner but the others were let go to continue on their way. So were the orders coming from Riel. From Sinclair they demanded food saying they were starving but their demands did not stop there. They started breaking boxes, untying bales, cutting open bags of sugar and flour with their knives taking whatever pleased them and destroying the rest. This act of vandalism it is said cost the Hudson's Bay Company the enormous sum of $40,000.00. While the post was being looted Sinclair managed to slip away from his guards and fled by canoe with two Metis men from Fort Carlton. As they were escaping one of the looters by the name of Makesis shot at Sinclair but his life was saved when his aim was broken by the chief to whom he had earlier given a pair of embroidered gloves. Meanwhile the four other boats continued their trip to Ile a la Crosse in the cold and rain. On the third day while they camped on the side of the river Mrs. Sinclair gave birth to a girl who was baptised immediately by Father Paquette. Mr. Sinclair who had joined them rejoiced and the Metis decided it was a good time to celebrate. Since they had 6,000 pounds of powder with them they used some of it to fire their rifles into the air 300 times after which Sinclair gave them a "regale" (a dram of rum?). "The looting of Green Lake House" is loosely translated from the following book. Le Chevallier, Jules Jean Marie Joseph (1876-1952) [info]. Aux prises avec le tourmente: les missionnaires de la colonie de Saint-Laurent-de-Grandin durant l'insurrection métisse de 1885. Ottawa: [Revue de l'Université d'Ottawa], 1940. .